For some days I have been wanting to post an inspiring and hopeful New Year’s message to EARTH CONNECTION readers. I thought about writing something myself but couldn’t come up with anything. I looked around on the Internet but couldn’t find the uplifting message I was looking for. Although I wanted to send out a message of hope and encouragement, the truth is, I need such a message myself. Since I couldn’t create or find the upbeat message I wanted, I decided to go where my natural energies were leading me–to learn about the despair work of Joanna Macy. I’d been thinking for quite awhile about this wise woman who, in the 1980s, helped people to confront honestly the possibility of nuclear annihilation and to deal with their feelings about it in healthy, empowering ways. What might she have to say now, I wondered. Would she have wisdom for dealing with fear, grief, and despair about our dying planet? Could she offer guidance for finding empowerment? So I looked into Ms. Macy’s recent work, and I found just what I needed to bolster myself in the coming year. I hope it will benefit you as well. In her beautiful, thoughtful, instructive piece to which I post a link below, Ms. Macy writes of the necessity of allowing ourselves to fully feel our pain, fear and sorrow over the future of our planet and all that we hold dear. While such a course is difficult, it is the only way, she believes, to be healthy and to find the power to act effectively on behalf of our planet. We are not helpless, she says. But because we fear the feeling of helplessness, we turn away from our natural love and grief for the earth. So this is the message of hope that feels right to me this New Year’s. We are in a terrible situation. We must honestly face it and experience the depth of our feelings about it. It seems counterintuitive, but doing so will empower us. And we need to be empowered if we are to act for our future and that of our children. Ms. Macy’s artaicle is very long, but very much worth reading. I invite you to make the time for it. Joanna Macy has given me an idea for 2011. I plan to learn more about the Council of All Beings program and the collective mourning mourning ritual she has developed to help people to work through their repressed responses to the threat of environmental disaster. I am thinking about organizing such an event in my area. When It’s Time for Your Christmas Tree to Go. . . . .
1. 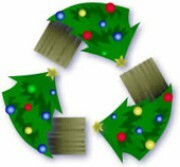 Recycle it: Many communities across the United States offer recycling programs for properly prepared Christmas trees. Check with your local government or waste management companies for more information. Remember: trees that have been flocked, painted or fireproofed cannot typically be recycled. So, keep that in mind when you shop for a tree. Always, remove all ornaments, tinsel, nails and stands. If your tree is taller than 6 feet, cut it in half. 2. Feed the birds: Before you recycle, set the tree in your back yard and decorate it with orange slices, cranberries or popcorn. The birds will love the winter feast. Just be sure to first remove all tinsel, lights and decorations. 3. Chip it: Christmas trees can be run through a chipper or shredder to make mulch for garden paths. Chips also make effective bulk for compost piles. Again, be sure the tree has been stripped of decorations before you put it in the chipper. 4. Mulch it: Remove needles and use as a layer of mulch in your garden. It’s a great way to conserve water and to fight weeds. The needles are especially appropriate for acid-loving plants. Use the stripped tree to later support climbing beans or sweet peas. 5. Protect wildlife: Have a big yard? Consider leaving the tree outside to decompose naturally. These trees provide valuable wildlife cover for birds, rabbits and other small animals. Over time, trees decay and add nutrients to soil. 6. Smell it: Use aromatic needles in potpourri. Combine dry, crumbled needles with whole cloves, broken cinnamon sticks, dried orange peel and orrisroot. Add several drops of fir, cedar, orange and/or cinnamon essential oil(s). Keep covered for at least a week so scents blend. Stir regularly. Display in bowls or make scented pillows. 7. Take a bath: Soaking in a pine-needle-infused bath is popular in the European Alps. In fact, pine is widely used for muscle pain, rheumatism and circulation problems, according to “The Herb Society of America’s Encyclopedia of Herbs and Their Uses” (Dorling Kindersley Publishing, 2001).To make a soothing pine-bath concoction, gently boil 1/2 cup of washed needles in 2 1/2 cups of water, covered, for 20 minutes. Strain. Pour needle tea and 1 cup of Epsom salts in hot bath. The needles, meanwhile, can be scattered in your garden. 8. Make a massage oil: For a homemade remedy for aching bones, infuse pine needles in oil.Fill a glass Mason jar with washed needles and sweet almond oil. Close tightly and place in a sunny spot. Allow to steep for at least three weeks. For stronger oil, steep longer. Use as a bath oil.Caution: Never use trees that have been sprayed with fire retardant or other artificial substances in bath tea or oil. Ingredients listed here are safe for most people, but always check for skin sensitivities. I went outside a few mornings ago and stood around in the snow for awhile. Just standing around may seem like an aimless activity, but I’ve learned that staying in one spot for a bit is the best way to really see. While I’ve always enjoyed looking about at the landscape while taking a brisk walk, it took me many years to realize that there was far more to be seen than I was able to take in when moving at a fast clip. It sounds obvious, but–the more I look, the more I see. Take my recent morning, for instance. Standing in the snow among some trees near our house, I first took in the distinct differences in bark on the several types of trees around me–the deeply furrowed bark of the old chestnut oaks, the smooth bark of young red maples, and the darkly outlined facets of the pine’s trunk. I looked admiringly at three chestnut oaks growing out of the same base. Only because I stayed stationary for a little while did I notice signs of major woodpecker action on one of the three. A long, vertical, gouged opening in the trunk told me that a pileated woodpecker had been there. As I stepped closer, I saw that the bird had given the tree quite a workover. The elongated hole went deep into the trunk. And it appeared that this woodpecker had even pecked out a second hole, still deeper into the tree from a perch it had made within the first hole. This oak tree must be quite a favorite of the woodpeckers. Above the long, large hole the pileated woodpecker had made was a small circular one. And when I stepped around to the other side of the tree, I saw two more small, fresh-looking openings, the round kind made by the smaller woodpeckers we see around here, perhaps a downy, or maybe a red-belly. And, as I stood there, I could see that the work of these birds had been recent. Bits of fresh wood littered the snow near the tree. As I walked on a little, I stopped to gaze at a handsome tree that reached its bare arms grandly to the sky. What was it, I wondered. Any nearby fallen leaves that could have given me my answer were covered with snow. As I stared upward at the branches that became thinner as they reached higher, I noticed two prickly little spheres hanging in the uppermost branches. They were this tree’s last ones, but they were enough to tell me their handsome owner was a sweet gum tree. Heading back toward home, I stopped to gaze at a tree I ‘know.’ With its proximity to the glass doors of our bedroom, this red maple is a much-watched tree. As I looked up at the maple’s slight, graceful branches, I savored their bare winter beauty. Almost the way I might remember my grown son at earlier phases of his life, I recalled watching, many months ago, when the first moist green leaves began to emerge and hang, folded, from the branches. I thought about how they opened and grew, toughening with the passing months, until their green finally gave way to orange and red, and then the tree released them and they fell to the ground. All this I could see as I gazed at the silent, grey being I look at so often. If you share my fascination with crystals, then you’ll want to click on the link below to Dusky’s Wonders Site. Dusky shows photos of some underground crystals that have grown to gargantuan proportions inside a cave system more than 1,000 feet below the Mexican desert. I did a little research and learned that underground crystals grow larger than the above-ground crystals we’re used to. The reason: an underground environment that is conducive to crystal growth is much more likely to remain undisturbed than a comparable above-ground environment. Scientists say that the giant crystal obelisks in the photos began forming millions of years ago in a cave system where groundwater was saturated in calcium sulphate. Then magma from much deeper in the earth spread upward and made its way throughout the cave system. About 600,000 years ago the magma began to cool, and minerals started to precipitate out of the water. Over the centuries, the tiny crystals the minerals formed grew and grew. Then in 1985, lead miners discovered the fantastic formations when they inadvertently drained the cave with their mine pumps. The crystals, some more than 30 feet long, resemble icicles. In looks only. The cave’s temperature is 112 degrees F, with 90-100% humidity. Visitors to the cave must wear protective suits and carry backpacks of ice-cooled air. Any frequent visitor to THE EARTH CONNECTION can tell that I am enamored of the writing of Henry David Thoreau. Brazil deserves praise and thanks from all of us for its recent, extraordinarily effective efforts to protect the Amazon rainforest. For many years, increasing destruction of vast swaths of the Brazilian rainforest contributed significantly to planet-warming greenhouse gas emissions and to a diminution of the world’s most biologically diverse region. But things have changed. Between August 2008 and July 2009, Brazil slowed the rainforest deforestation rate by 45% over the previous 12-month period. And between August 2009 and July 2010, the deforestation rate fell another 14% below that of the previous year. These dramatic reductions will help Brazil to meet its goal of reducing deforestation by 80% by 2020. In fact, says Brazil’s President Luiz Inacio Lula da Silva, conservation efforts are going so well that he expects his country to meet that goal by 2016, four years ahead of schedule. If Brazil can meet its deforestation reduction goals, the country will reduce its greenhouse gas emissions by almost 25%, according to a government statement. Once the world’s biggest source of deforestation-caused greenhouse emissions, Brazil now leads the world in reducing deforestation. And how has Brazil managed to curb deforestation so dramatically? The answer, according to Brazil’s Environment Minister Izabella Teixeira, lies with the Action Plan for Deforestation Control and Prevention in the Amazon. Launched in 2004, the Action Plan includes policies to improve monitoring, strengthen enforcement, and encourage sustainable activities in the region. A key ingredient in Brazil’s approach has been the government’s near-real time deforestation detection system. Relying on up-to-date satellite images, the Brazilian Institute of Environment and Renewable Natural Resources, in conjunction with the Federal Police, have been able to set up precise and effective enforcement operations to halt illegal deforestation as it happens. Other factors in Brazil’s success include the engagement of the citizenry and the private sector to support deforestation efforts. And seven of the nine states in the Amazon region have developed their own action plans to fight deforestation at the local level. I thank Fred Andrle for sending me this poem. It is a beautiful expression of the grief and anguish I feel about our planet’s sharply declining health. there are no promises for her return. now mother of us all is leaving. but we were silent, and we dared not speak. and we turned our faces. we pray for her return. This poem can be found, along with many of Fred’s others, in his book LOVE LIFE, available from amazon.com. On a winter walk in the woods a couple of years ago, I noticed something intriguing. Certain small, slender trees were dotted with yellow. And that yellow, striking against the pale winter landscape, had a wild look. Clusters of little, unruly-looking yellow ‘straps’ dotted these trees’ bare branches. I learned that the yellow was the bloom of witch hazel, North America’s only tree that wears its flowers, ripe fruit, and next year’s buds on its branches all at the same time. And that time is winter! Each flower on the witch hazel tree is made of four strap-shaped yellow petals. The flowers are pollinated by bees and flies. But since few bees and flies are buzzing about in November and December, the pollination rate is low, and only a small proportion of witch hazel flowers produce mature fruit. And even though pollination takes place late in the year, fertilization of the ovules does not occur until the following spring. The fruit then begins to develop, and it is ripe by the following fall or winter, after the witch hazel tree has lost its leaves and the tree’s flowers bloom. Witch hazel fruit are two-part capsules, with a single black, glossy seed contained in each part. During the late fall and winter months, the ripened capsules suddenly burst open with a loud snap. The seeds are ejected so forcefully that they can be propelled as far as 30 feet from the tree. Witch hazel seeds are food for grouse, rabbits, beavers, and other animals. The seeds germinate the following spring. My curiosity about the witch hazel was renewed several weeks ago when I hiked in the Shenandoah National Park with two friends. We were delighted to spot some witch hazel trees in their full, ragged bloom. But near the blooming trees, we saw other witch hazel trees that were not flowering. Where their flowers would have been were instead tiny, flattish, yellow-rimmed circles that were dark in the middle. We surmised that these compact little forms were flowers not yet opened. But it seemed strange that such a tight, orderly-looking form could open into something so rangy and disordered-looking as the witch hazel flower. The witch hazel tree has a long history of human uses. Back in the 1840s, writes West Virginia ecologist Elizabeth Byers, an entrepreneur named Theron Pond of Utica, New York, formed a partnership with the Oneida tribe to make and market an astringent lotion from witch hazel bark, which was sold under the name “Pond’s Extract.” It was the first mass-marketed cosmetic actually made in America, says Byers. Extracts from the bark and leaves have been used in aftershave lotions and in lotions for treating bruises and insect bites. It was cold when I stepped out of the house this morning. The temperature was well below freezing, a fact confirmed by patches of ice here and there. Yet, as I walked among the bare trees and the fallen brown leaves, it occurred to me that it is not actually winter yet. Winter won’t officially begin until the Winter Solstice, that moment almost three weeks from now when the earth’s axial tilt will reach its maximum distance from the sun. Even though much of the landscape wore a winter look, I could see that some plants were still in the throes of fall. Fall was clearly receding, but was in some spots still holding on. The smoke tree, for example, has become my new favorite in the last week since the giant sugar maple dropped all of its radiant orange leaves. The little smoke tree’s slender branches still held most of their leaves, and they flamed red, even if their edges curled downward, as if drawing inward against the cold. Contributing much less–but still some–color to the browning environment were the two corkscrew willows on our place. The leaves clinging here and there to curly, peeling branches had yellowed. But they were an anemic yellow, not a bright autumnal yellow. Providing vestiges of color for a little longer yet, these hangers-on would clearly soon be gone. The buddleia, or butterfly bush, was keeping its leaves awhile longer too, and also its blossoms, in spite of falling temperatures. But leaves and blossoms alike were clearly the worse for wear. The leaves, now a dark, somber green, drooped. And the blossoms that tipped each branch had become wilted, shrunken versions of their fresh, full, summer selves. As I walked down the outdoor stairs near the house, a leaf on a step caught my eye. A fallen magnolia leaf, it looked different from any magnolia leaf I’d seen before. Its middle was green, while the rest of the leaf had turned dark. When I picked it up for a closer look, the leaf cracked loose from a thin patch of ice which had held it to the step. The cold weather that followed yesterday’s rain must have turned the leaf’s wet underside to ice. And that ice, I figured, had frozen the leaf from the outside in. Today, Monday, November 29, is Day One of a 12-day climate change summit in Cancun, Mexico. Representatives from almost 200 countries will work to build on last December’s climate change summit in Copenhagen. While last year’s summit was a major disappointment in that the nations of the world failed to bind themselves to reduce carbon emissions, the meeting did at least result in a nonbinding agreement to take steps in the right direction. Part of the ‘Copenhagen Accord’ was a pledge by the richer nations to raise $100 billion a year by 2020 to help poor countries adapt to the effects of global warming, protect their forests, and pay for greener technologies that would lower their greenhouse emissions. Clearly, such help is needed. Extreme weather conditions that contributed to last summer’s unprecedented fires in Russia and unprecedented floods in Pakistan caused great human loss and damage to agricultural productivity. Forests in poor nations are rapidly disappearing as growing numbers of poor people have no choice but to cut down trees for cooking and warmth. And these countries have scant resources to invest in greening their economies. They need our help. So I invite you to join with me and with thousands of others in a national effort to urge President Obama to become a true global climate leader. We must insist that the U.S. keep its climate promises to the poorest peoples of the world. Even though the percentage of climate change deniers in Congress will jump in January when the new Congress is seated, President Obama must speak strongly and insist that the U.S. and the other rich nations fulfill the commitment made last year to help the world’s poor. This Wednesday, December 1, is a national call-in day to the White House. Please add your voice between 10 am and 5 pm EST. The main switchboard line, 202-456-1414, is the number at which you’re more likely to reach a real person. Or you can also call the White House comment line at 202-456-1111. At that number you will most likely reach a recording where you can leave a message. “My name is ____________________ and I’m from state or organization. I’m calling today to tell President Obama and his administration that we need him to be a global leader for the global climate movement. keeping his promise to mobilize public funds to help poor nations cope with climate chaos and transition to clean energy. You are currently browsing the Earth Connection blog archives for the year 2010.